The acting chief of staff strived to put the best face on the situation, even as others doubled down on the notion that it was a setback for Trump and his policies. The oft-repeated saying in politics is that no one wins when the federal government shuts down. On Sunday, acting White House chief of staff Mick Mulvaney did his best to make sure President Donald Trump wasn’t branded the loser this time. Mulvaney did his best to spin the wide perception, including among some conservatives, that Trump caved Friday by agreeing to reopen the federal government after the longest shutdown in American history without any money for his central campaign promise of a wall along the Mexican border. Instead, he stressed, the White House is ready to charge into three weeks of negotiations and test whether it can break rank-and-file Democrats from party leadership and garner support for the wall. It is unclear how the next 21 days of negotiations could yield a broad immigration deal with money for a wall that has eluded everyone for the past 35 days, but like Trump, Mulvaney vowed that a wall would be built one way or another. During the shutdown, Trump and Republicans tried repeatedly to peel support from House Speaker Nancy Pelosi (D-Calif.) and the Democratic Party leadership through public invitations to the White House, but most of those invites were declined and there was no large exodus elsewhere. 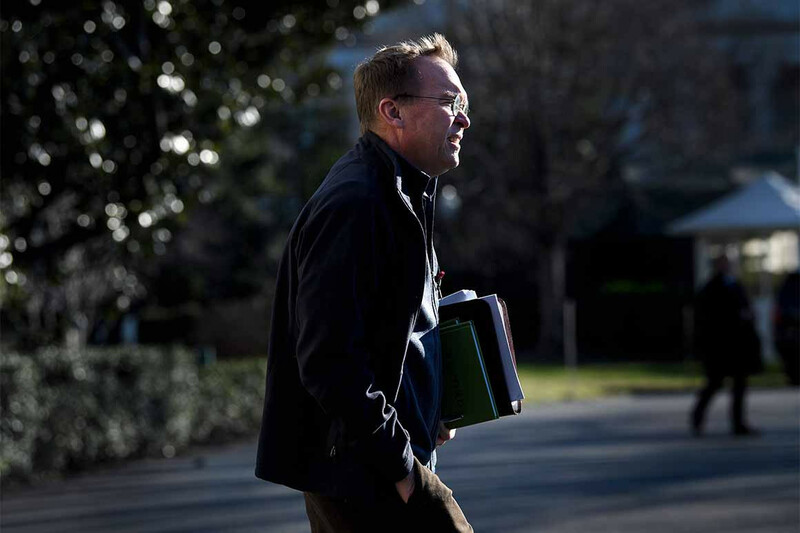 What is clear is that Trump will get his wall, Mulvaney said, confirming that the White House is revisiting the idea of declaring a national emergency to fund construction. “The president’s commitment is to protect the nation, and he’ll do it either with or without Congress,” Mulvaney said. Rep. Hakeem Jeffries (D-N.Y.), chairman of the House Democratic Caucus, said “enhanced fencing” would be on the table, but added that he views a wall as a “fifth-century solution to a 21st-century problem” and a waste of money. Sen. Joe Manchin (D-W.Va.) said a new approach to the whole process was needed. “There’s a lack of trust and a lack of belief on both sides,” he said on CBS’ “Face the Nation,” adding, “Right now we’re just caught in between and betwixt.“ Manchin‘s recommendation to avoid another shutdown: pass legislation that would keep lawmakers from getting paid if the government closes. Trump on Friday signed a three-week funding measure that reopened the federal government after a 35-day shutdown. Despite his repeated statements that he would not reopen the government without money for a wall or related barriers, Trump did exactly that. House Minority Leader Kevin McCarthy (R-Calif.) scoffed at the notion that the shutdown has empowered Pelosi, questioning how anything can be won if it is just a return to the status quo. Instead, the California Republican said Trump simply grew tired of the government shutdown. “Well, I’m not celebrating getting something because what people are celebrating, saying, ‘Speaker Pelosi is strong because she got status quo? '” McCarthy told Todd. Commentators on the Sunday morning news shows didn’t see Trump as having fared well in the shutdown. In assessing what went wrong for Trump, former New Jersey Gov. Chris Christie said on ABC’s “This Week” that the president and his advisers had failed to develop an endgame for the shutdown battle. “When you act on impulse and you don’t have a plan sometimes, as I think what happened with the shutdown, it doesn’t end well,“ Christie said.